Note: The following history of Jackson Baptist Church is presented by John Kirkland who is also the photographer. Screven County, Georgia, named for General James Screven, who served in the Revolutionary War (1775-83) was once called “a place in the woods” by poet Cuyler Young but Screven County and the area near the town of Sylvania have had a long rich history beginning with the Indians that originally inhabited the area before Georgia became a colony in 1752. In 1779, Patriot forces were defeated at the Battle of Briar Creek during the American Revolution, in 1791, President George Washington visited the area, in December of 1864, the Union Calvary under General Judson Kilpatrick filed through the area during General W. T. Sherman’s march to the sea. Soon after the Civil War, the hearts of eight men and women were stirred and Jackson Baptist Church, also known at Jackson Missionary Baptist Church was organized. 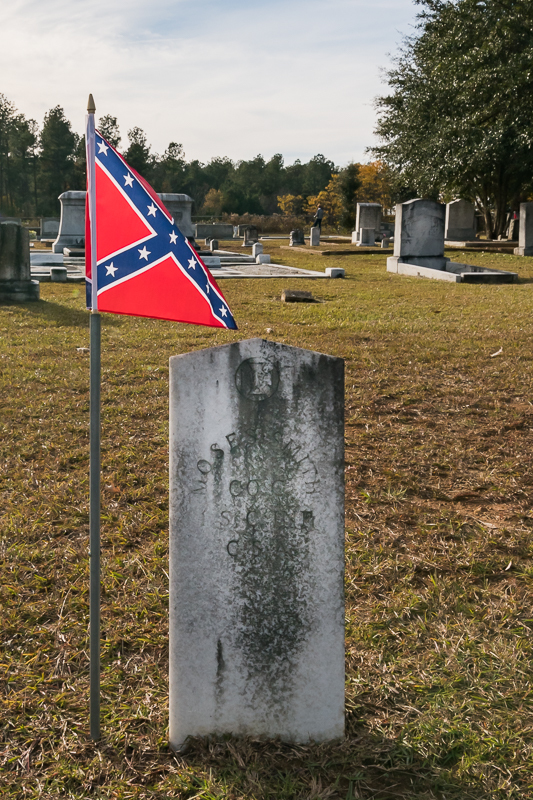 Many of those founding family names, Beard, Booker, Conner and Smoak can be found in the large cemetery next to the church along with early settlers of the area and veterans from the Civil War. Rev. C. E. Barefield preached Jackson Baptist Church’s first sermon in November of 1870. Originally the church met in a home known as the Brown House in which it is said that George Washington spent the night when he visited the area. In December of 1870 William H. Beard Sr, donated a parcel of land from his homestead located about ten miles east of Sylvania on the old Savannah and Augusta Stage Road at the 57th mile post. Here at this location the first church was built, named Jackson Baptist Church after Rev. G. L. Jackson and the rules of Christian belief were adopted. The first Presbytery of the church included: Rev. G. L. Jackson, Rev. M. N. McCall and Rev. C. E. Barefield. 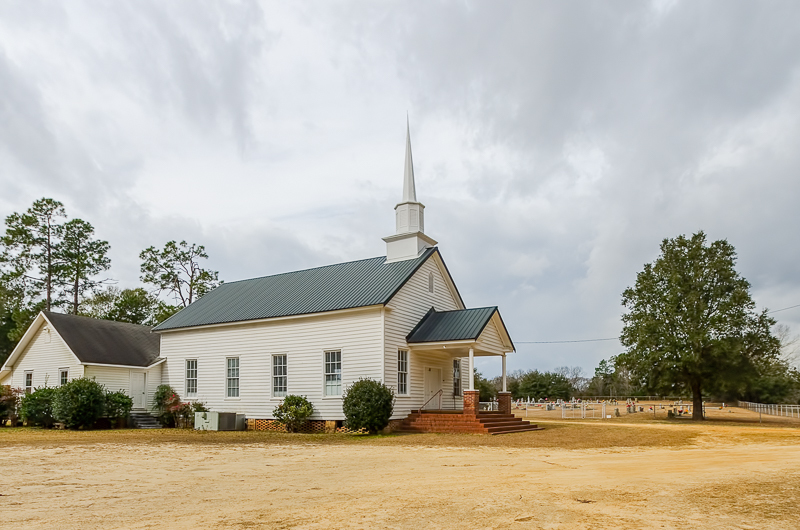 The church must have grown because after only twenty years, Alf Bryant was contracted in 1890 to build the second and present church that you see today. John Edenfield, a deacon of the church financed the contractor’s salary and the church was dedicated on the fifth Sunday in March 1891. Life was harder back then but these folks found ways to overcome. Let me give you a snapshot of life in Screven County, Georgia in the 1800s from some research I did on the Beard family members. I did not find much on Williams Henry Beard but having died at 65 his widowed wife remarried another man from the area who was listed as a farmer in the census. Then as well as today agriculture plays a big part in this area. Several families I spoke to while visiting the church had multiple members who were farmers. Benjamin Franklin “Frank” Beard enlisted 1861 at the age of 23 with Screven Troop and was transferred to the 5th Georgia Cavalry Regiment in 1863 as a teamster. A teamster was someone who drove horse or mule drawn wagons that kept the troops supplied by making trips back to the supply base (a dirty and sometimes dangerous job). He was paroled at Hillsboro, North Carolina in May 1865. He married in 1866 at the age of 28, became a framer and died in 1910. Bainbridge Decatur Beard was born in 1845, enlisted in 1863 at the age of 18, married after the war in 1871 at the age of 26, had the first of five children in 1878 at the age of 33 (all five were girls) and died in 1919 at the age of 74 probably as a farmer. President Roosevelt signed the Selective Training and Service Act (the draft) in 1940, but the Conscription Act of the 16th of August, 1862 passed by the Confederacy which was in need of troops was actually the first effective military draft in America and the Federal government instituted its own draft a year later, in March 1863. It stated in part…”All male persons between 18 and 45, excepting idiots and those convicted of crime are to be enrolled and subject to draft by order of the President”. The reason for moving the county seat from Jacksonborough to Sylvania (only miles apart) is unclear but some say it was due to a curse placed on the town by the Methodist preacher Lorenzo Dow who was badly mistreated and threatened while preaching against the lifestyle of those in Jacksonborough. Once a thriving town, a few years after the curse only one building remained. The Seaborn Goodall house where Dow was allowed to stay in safety until leaving. Over the years Jackson Baptist Church ordained two pastors for the ministry who had a major impact near and far, one as far away as Cuba. The Rev. Moses McCall spent thirty-nine years ministering to the people of Cuba. He was instrumental in developing the Southern Baptist presence there, planting churches and founded the oldest evangelical institution in Cuba, the Havana Baptist Theological Seminary in 1906. The Rev. G. R. McCall pastored churches in and around Screven County and faithfully served the Georgia Missions Board for many years. The McCall family name was very prominent in Georgia. Many were pastors, doctors and military men. 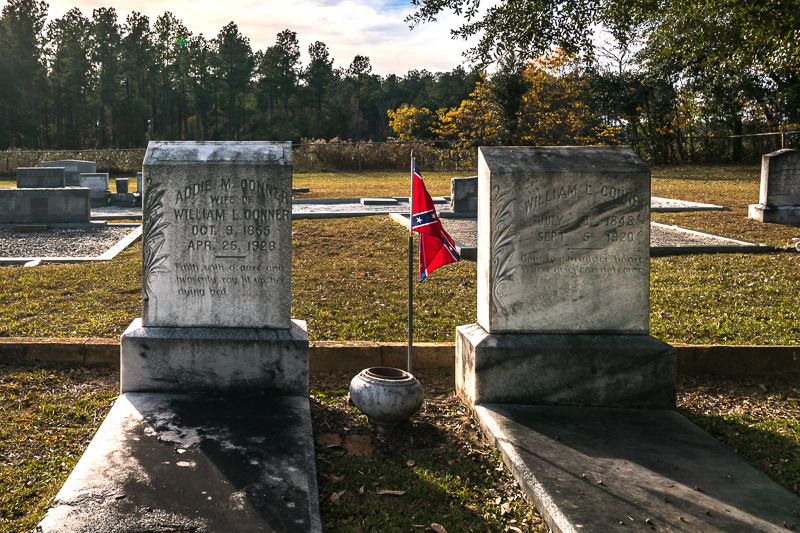 Even though Jackson Baptist Church wasn’t around until after the Civil War, its cemetery holds many of the settlers and veterans from that era. The interior of this almost 130 year old church building remains in remarkably good condition. 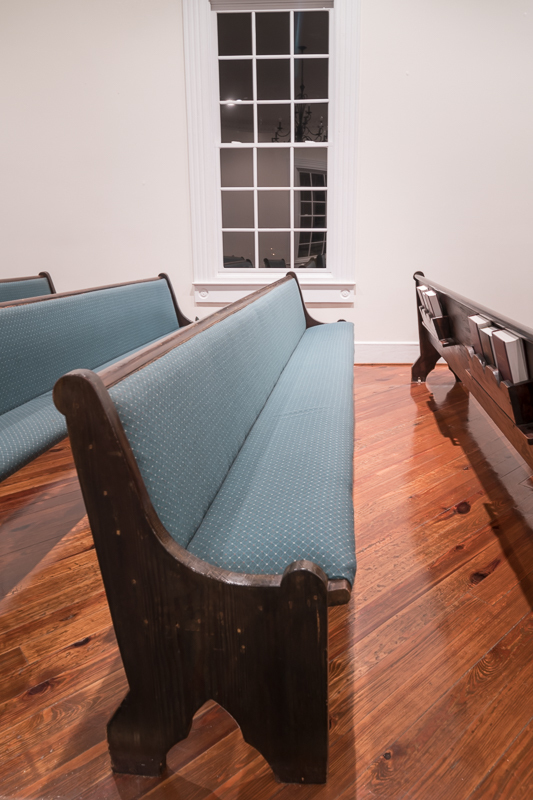 Here we have a snapshot of one of the rows of pews. Notice that the floors were laid diagonally and remain in excellent condition. 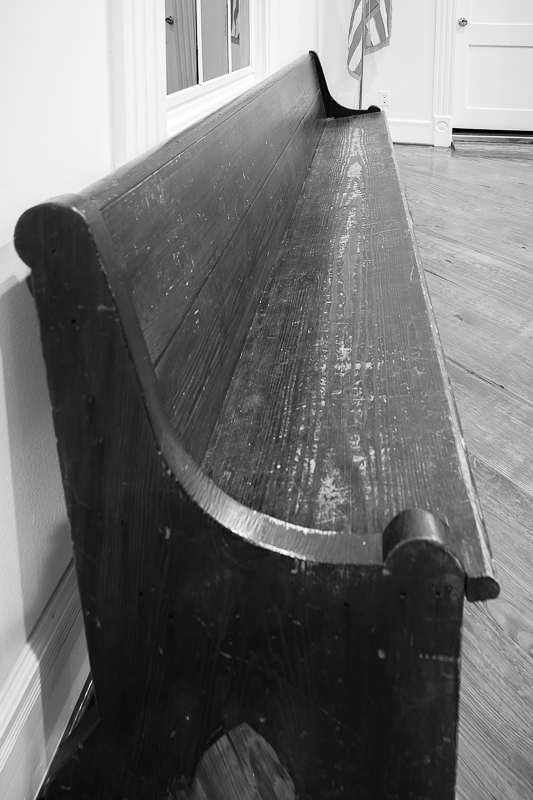 The original pews are still in place and rest comfortably on the old heart pine floor boards. Cushioning has been added for comfort in the pews, but the authentic appearance of the interior is not disturbed. Also original, one of the 9 over 9 , wooden window frames with its clear glass panes is visible in the background. Designed and built on the cusp of the 20th century, this Baptist church avoids the decorative and architectural flamboyance seen in many of the other rural churches built at the end of the Victorian era. 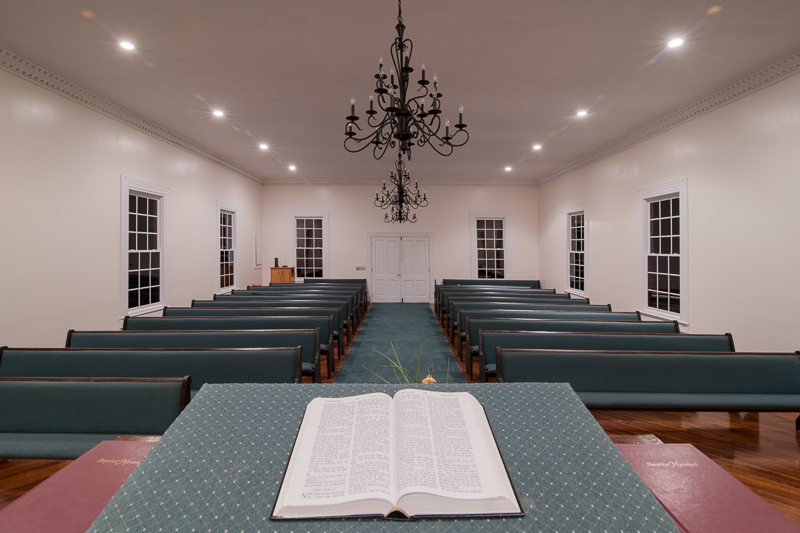 Here we see a spare sanctuary that reflects the Baptist tenet that “less is more.” The rectangular sanctuary is painted completely white. The simple crown molding, wooden window frames and entry doors are the only architectural design features in site. The view we see above is likely quite similar to the one from the pulpit in the 1890’s. 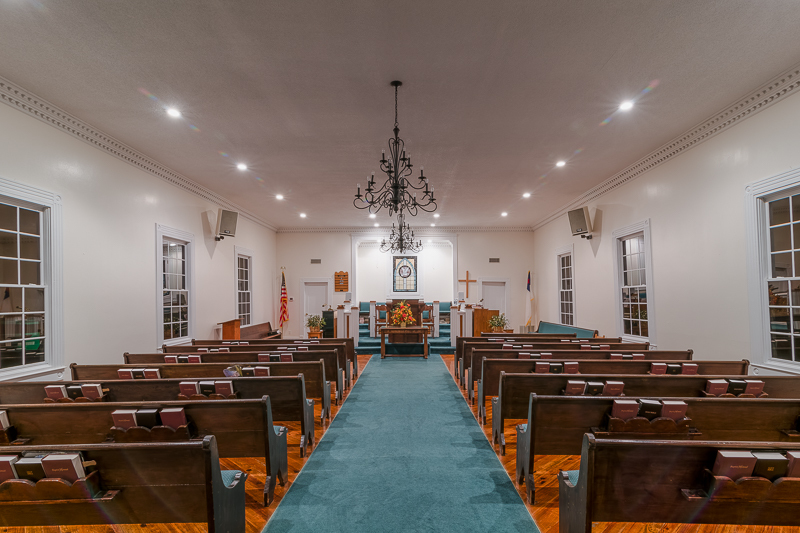 We feel sure that the ornate chandelier was added well after the building’s construction along with the padded pews. Here we see a chair that is one of the pieces of furniture on the chancel in the pulpit area. Unlike the rest of the sanctuary, this is of late Victorian design and reflects the highly decorative styles of that era. It is likely some of the original decorative and functional furnishings bought for the “new” church. Here is a look at one of the original pews. It was not “modernized”. Likely it was left “as is” in the sanctuary to reflect the historic and simple roots that run deep in this important old church. 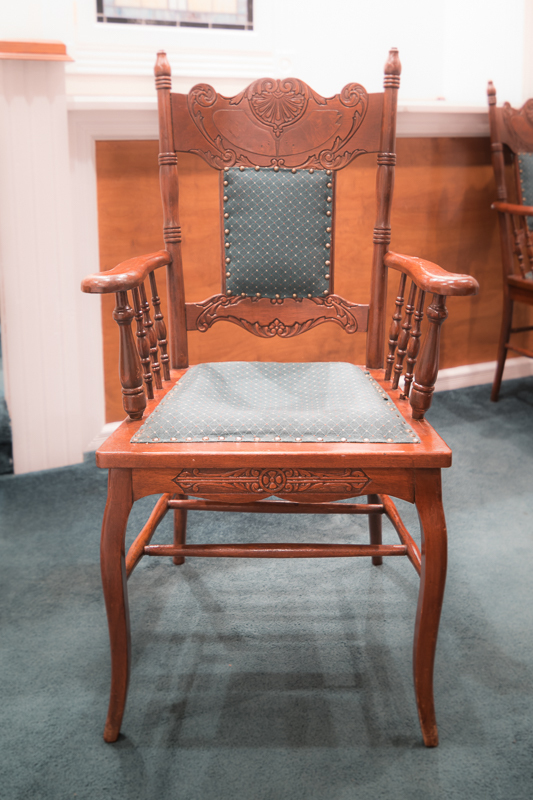 It sits in the sanctuary for all to see as a prized relic of the past at Jackson Baptist. Here we are looking into the church from the entry doors. We feel that this photo emphasizes the cozy and friendly atmosphere we find within this old meeting house. It is small but welcoming. The wooden glow from the heart pine floors and pews warms up the white walls and ceilings. The back lit proscenium reaches out to invite in the congregation and/or any others who enter this place of worship. The pews that flank the aisle stand ready for another lovely service. We applaud the congregation that has done such a wonderful job in keeping this treasured site alive and well today… and for generations to come. General Lamar Mock first shows up in Screven County census records in 1850 when he was listed as a one year old. In 1880 his occupation is given as carpenter but later census records show him as a farmer. He married Susan Emily Lee about 1872 and they had four children. Joseph Lawton Edenfield enlisted first in Company B, 2nd South Carolina Cavalry Regiment. This unit was disbanded in 1864 and he enlisted in Company B, 2nd Georgia Cavalry Regiment. 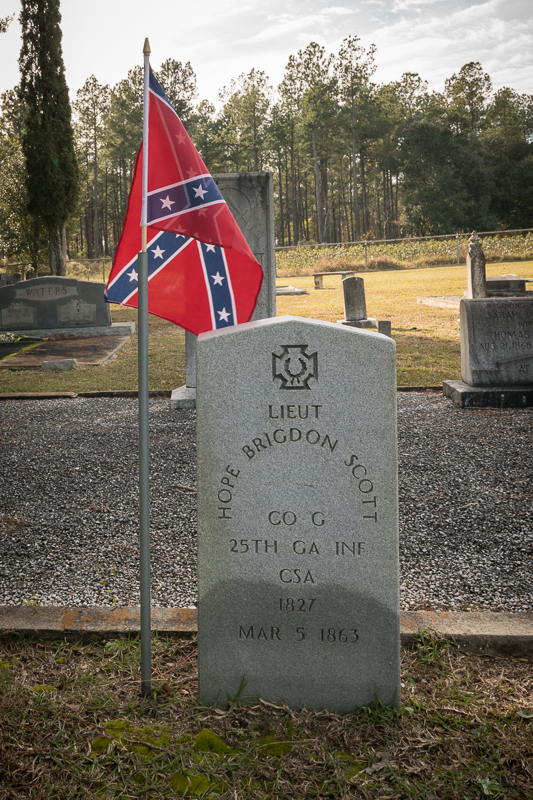 He surrendered in North Carolina at the end of the war. His widow, Laura Egerton Wilson Edenfield stated in her pension application they were married January 28, 1862 in Barnwell District, SC. J. J. Braxton was in the same SC unit and was a witness for Joseph Lawton Edenfield’s wife’s pension application. William Lucas Conner served as a private in Company B, 2nd Battalion, Georgia Cavalry. His father Simeon Daniel Conner was the captain of Company B. Captain Simeon Daniel Conner was the Justice of the Inferior Court in Screven County. He resigned his position in 1861 to become captain of Company B, 2nd Battalion, Georgia Cavalry. He resigned his position with Company B in 1863. Simeon Daniel Conner was a deacon and early trustee of Jackson Baptist Church. Moses Smith’s Confederate Pension application shows he served as a private in Company C, 1st Regiment of South Carolina Volunteers and that he died 29 January 1925 in Screven County, Georgia. In July, 1864 at the Battle of Fort Harrison in Virginia he received a gunshot wound to his left arm and chest causing the entire loss of the use of his left arm and hand. His pension application also shows his son-in-law, Layton F. Berry, received $51 for his casket, suit of clothes, socks, collar, tie, digging grave and building vault, and one trip to the doctor. His Screven County, Georgia death certificate states he died at the age of 98 years. According to the death certificate of his daughter, Elizabeth Smith Berry, his wife was Elizabeth Miller. 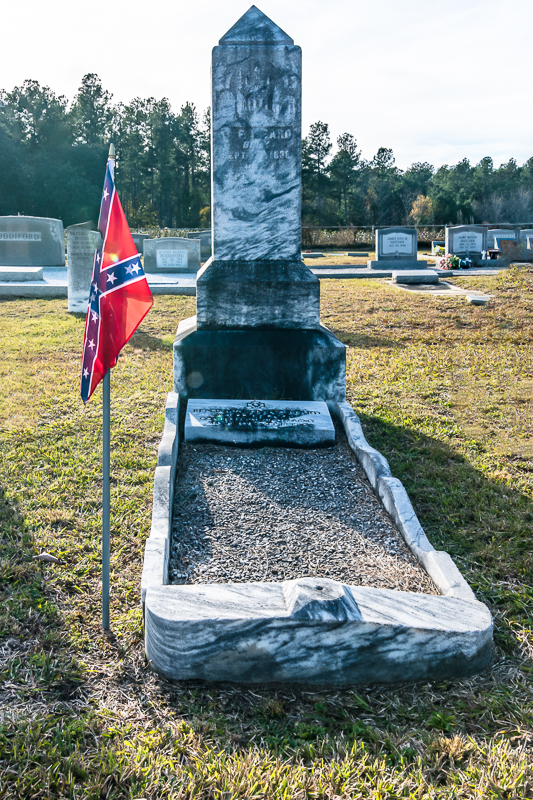 Both his daughter and her husband are also buried at Jackson Baptist Church Cemetery in Screven County. Benjamin Franklin “Frank” Beard enlisted 1861 at the age of 23 with Screven Troop and was transferred to the 5th Georgia Cavalry in 1863 as a teamster. A teamster was someone who drove horse or mule drawn wagons that kept the troops supplied by making trips back to the supply base (a dirty and sometimes dangerous job). He was paroled at Hillsboro, North Carolina in May 1865. 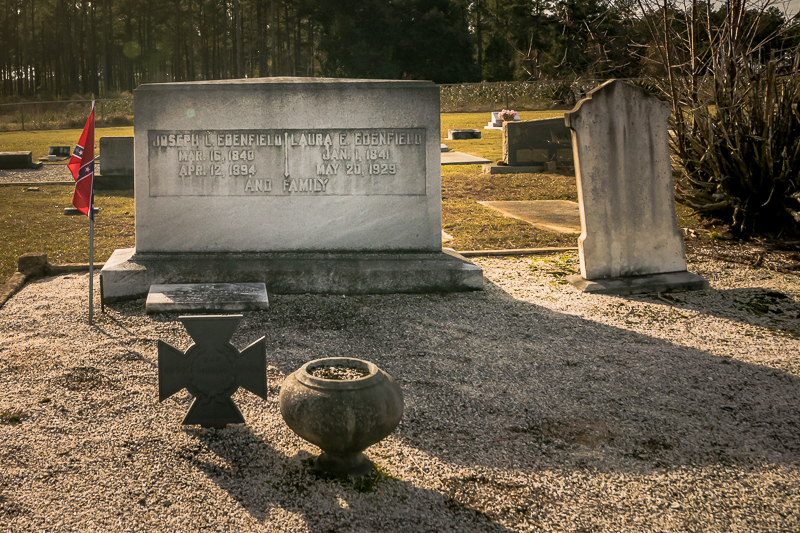 His brothers William Henry Beard and John C. Beard also served in the 5th Georgia Cavalry. Bainbridge Decatur Beard served in the 5th Georgia Cavalry and was probably a cousin to these brothers. All of these Beards are buried at Jackson Baptist Church. 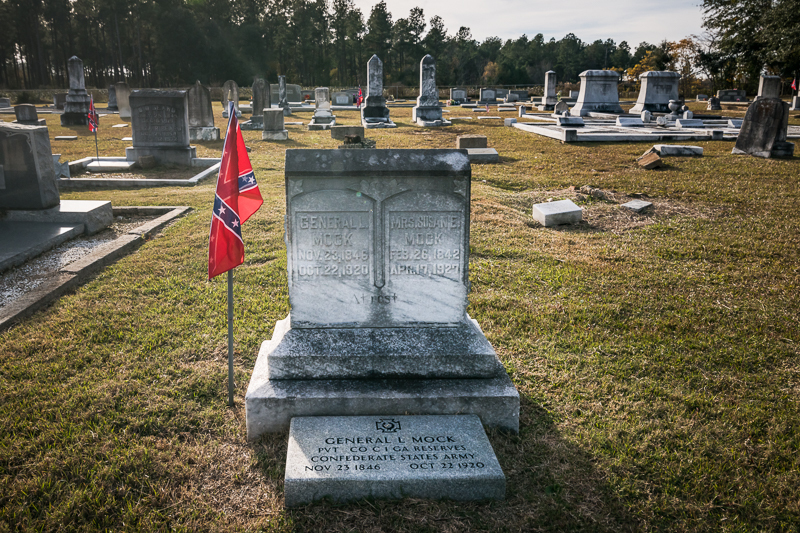 The church was not formed till after the Civil War but the cemetery is filled with CSA veterans and the flags that honor their service. We always have to remember that what we see here is just the ones who survived that dark and tragic part of American history.